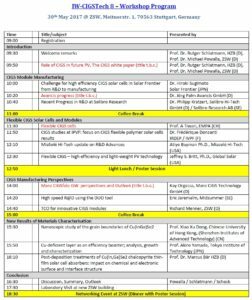 The workshop programme for IW-CIGSTech 8, jointly organized by HZB and ZSW, has been published and can be found at the iw-cigstech homepage. Do not miss the opportunity to take part in the discussion with renowned CIGS experts for the very small fee of 150 Euro plus VAT – register now! You are also welcome to submit a poster. Please e-mail your name, title and affiliation to poster [at] iw-cigstech [dot] org.